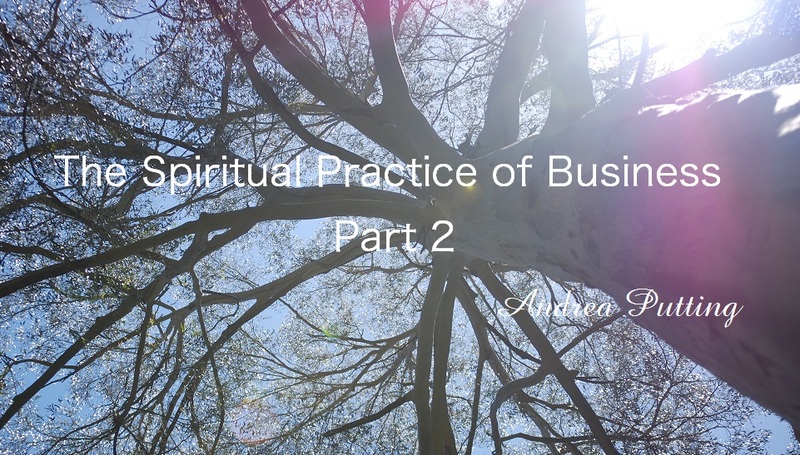 What does Spirituality in Business even mean? Generally speaking there is a big focus on our material needs. The advice goes, “Deal with these first, then once you have yourself set up you can be more altruistic in what you are doing.” You need to support yourself, your family, pay the bills etc.. It is about survival mode. Food, water, housing, clothing, now your basic needs are met. Now what? Well I have to make sure my emotional needs are met. Let’s focus on these for a while. Oh no, lost focus on the basic needs, have bills to pay. Back to square one. Eventually, we might get around to spending some time on Spiritual needs, but right now I just don’t have time. I’m too busy taking care of business and family. That is how it goes. The end result is that we are constantly focused on our basic needs. 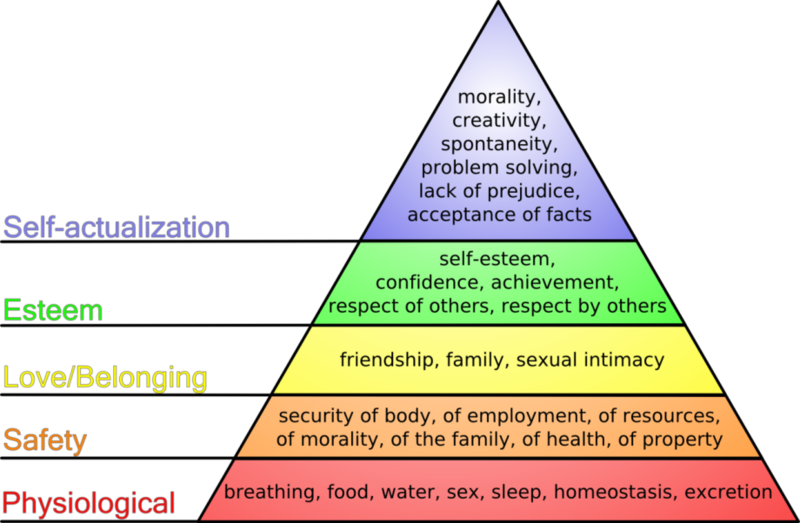 If we look at Maslow’s Hierarchy, we see that the basic needs in life take the most of our time. The philosophy behind this model is that is that we need to take care of the lowest and biggest level first. When we have that taken can of we are the able to move into the next level and so on. So from this, is Spirituality the very last thing we are able to deal with? We have to have everything else in place first. What a long journey to get to Spirituality and a fulfilling life. It’s as if it is a reward for all of our hard work. However Maslow realised. ” A healthy man is primarily motivated by his needs to develop and actualise his fullest potentials and capacities.” So, what if we turned things around at looked at this from the top rather than the bottom? 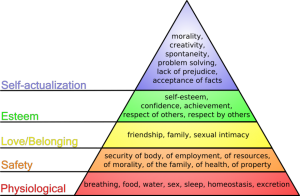 Rather than looking at our world from the basic physical needs of our life, we looked at them from the top. We looked at everything through a Spiritual filter. We very much live in the physical world. We have bodies, we feel with our bodies, we touch, we move, we feed our bodies to keep alive. We are focused on this physicality of life. Yet, we are in fact spiritual beings in this physical body. We are experiencing the physicality of life on earth. We are playing a physical game, which we are totally absorbed in. We are so in-depth in this game that many aren’t even aware of the reality of it. Well done. When we allow ourselves to stop and re-connect in with our spirituality the whole world changes. What we see is very different from before. There is no separation between God and us. There is no separation between us and others. We connect in with the oneness and accept ourselves as an individual expression of God. There is recognition that we to have the power to create our world as we want it to be. We are no longer victims. It is time to connect in with our own true self and purpose of being here. I hear the sceptics in the room. They want me to get back down to basics. Telling me “but you have to take care of these needs first.” “Get your head out of the clouds.” Well, I’m not saying we don’t take care of our basics needs and throw out everything, walk across the desert with no provisions and expect God to take care of all our needs. Neither am I saying that is not possible. Where I am coming from is, however, about putting it all the hands of God, the Divine, the universe, or whatever terminology suits you. I’m talking about instead of considering our Spiritual life as the last coat off the peg: it is now the first think we think of. How do I, as a spiritual being address my basic needs, my emotional needs, and the needs of others? 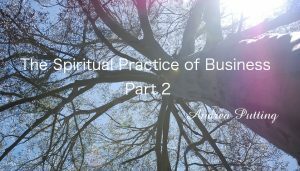 How do I, build my business from the place of spirit, putting my and others spiritual needs first? Yet still meet all my other needs and the needs of my employees and customers.